Description of "Love @ 7 (eBook)"
Love in the times of whats app and facebook ? Does it exist? Do you believe that there's someone from heaven just made for you? Is it delivered right on the door or require some curious searching? To say the least, its everywhere. You just need a keen eye to spot it. 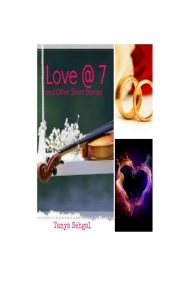 Love @ 7 (and other short stories) is a compilation of beautifully woven short tales which eagerly desire to be told. A full time MBA, a hobbyist writer, finicky about being published, blogger, lover , innately psychic, contemplative and a keen observer. Insights about who I really am. Hope you all love the compilation after appreciating my blog. Reviews of "Love @ 7 (eBook)"